We officially have a new Mayor! I’m not sure I ever realized this was a thing before, but apparently new Mayors are traditionally officially sworn in at midnight on inauguration morning. And sticking with tradition, Providence’s 38th Mayor, Jorge Elorza was officially sworn-in very early this morning (or late last night) at his home. PROVIDENCE, RI – Jorge O. Elorza was sworn in at 12 a.m. today as Providence’s 38th Mayor. The private ceremony, which marked the official transition of power in the City of Providence, was held at Mayor Elorza’s home with family and friends. Probate Court Judge John E. Martinelli administered the oath of office. Elorza, 38, a former Housing Court Judge and professor at the Roger Williams University School of Law, is the son of Guatemalan immigrants who worked in factories and was raised in the city’s West End. He graduated from Classical High School before going on to the University of Rhode Island and Harvard Law School. 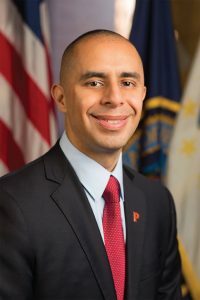 As a law professor at Roger Williams University, Mayor Elorza co-founded the Latino Policy Institute, a think-tank dedicated to research on Latino and minority communities in Rhode Island. While serving on Providence’s Housing Court, Mayor Elorza created a process to hold large banks accountable for abandoned properties in the city. Mayor Elorza began his first morning as Mayor by joining with local faith leaders at an Interfaith Breakfast held at the Providence Career and Technical Academy. Mayor Elorza’s public inauguration will take place today at 2 p.m. on the steps of City Hall, in front of an anticipated crowd of several hundred residents and dignitaries. The ceremony is free and open to the public. Victor Capellan, a community leader, educational consultant and co-chair of Mayor Elorza’s transition team, will serve as the Inauguration’s Master of Ceremonies. The Providence Fire Department and Providence Police Department Honor Guard will conduct the Presentation of Colors. The Reverend Maria DeCarvalho, an ordained priest with the Episcopal Diocese of Rhode Island, will give the Invocation. The Pledge of Allegiance will be led by students from the first and second grade classes at the Lillian Feinstein School at Sackett Street. The National Anthem will be performed by Ashley Soto, a junior at Classical High School who brought to life Mayor Elorza’s campaign theme song. Governor-elect Gina Raimondo will deliver greetings from the State of Rhode Island. Jamie Espinal, a teacher, poet and Christian hip hop artist, will recite “The Time Is Now” – a poem written especially for Mayor Elorza’s Inauguration. The Oath of Office will be administered by retired state Superior Court Judge the Honorable Judge Francis J. Darigan, Jr.
Edward D. Feldstein, a Providence attorney and close friend of Mayor Elorza, will present the Mayor for his delivery of the Inaugural Address. The ceremony will conclude with a Benediction offered by Dr. James P. Huguley. The Rhode Island Highlanders Pipe Band will perform during the exit processional. 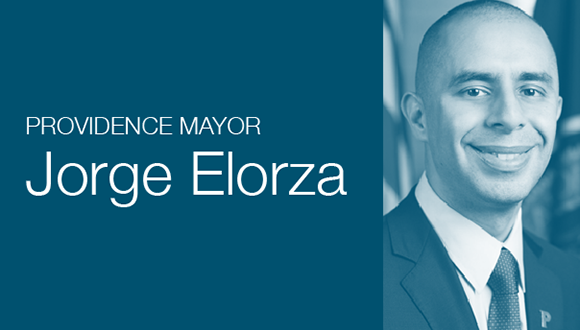 Following the inauguration, Mayor Elorza will hold a reception inside City Hall that is free and open to the public. At 7 p.m., Mayor Elorza will host his One Providence Inaugural Celebration at the Cranston Street Armory, where there hasn’t been an inaugural celebration in decades. The inaugural celebration will feature food and performances that highlight Providence’s artistic, cultural and culinary scene. The inaugural celebration, which is free and was open to the public for registration, has sold out. Parking is limited in the surrounding area of the Cranston Street Armory. There will be limited valet parking and on-street parking. Guests who registered and received tickets are encouraged to carpool, use free or discounted rides from Uber or bike ride and make use of the event’s bicycle valet. The inaugural celebration concludes an exciting lineup of events held throughout the weekend to showcase Providence and promote community service. On Saturday, January 3, Mayor Elorza asked residents to celebrate their civic pride and give back to the community through volunteerism by participating in his One Providence Day of Service. Food items were collected for the Rhode Island Food Bank at venues across the city. Yesterday, the Providence Children’s Museum hosted the Children’s Inaugural Celebration. The event was free for Providence residents. No taxpayer dollars were used to pay for any of the inaugural events.